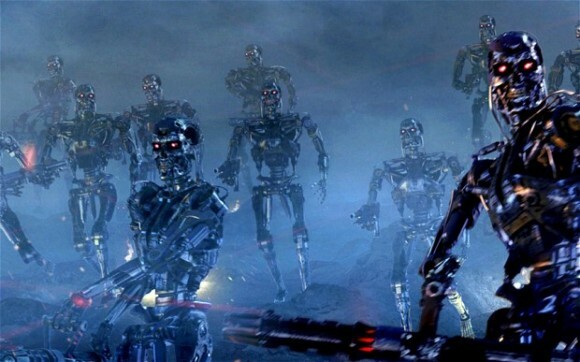 "“THE development of full artificial intelligence could spell the end of the human race,” Stephen Hawking warns. Elon Musk fears that the development of artificial intelligence, or AI, may be the biggest existential threat humanity faces. Bill Gates urges people to beware of it. Seems more and more like "The Matrix" to me. Now IF there were no devious people on earth, we might have nothing to be concerned about, but we all know that is not the way it is. "The Touchpoint Group hopes to develop an angry AI, using two years’ worth of customer calls from four of Australia’s largest banks. Over the next six months, a team of data scientists will use these calls to build a model that companies can then use to find the best response to common customer complaints." And customers would be even more angrier if they have to talk to robots for customer complaints, not humans. ...If we start to replace the posts with machines just because they are emotionally tough, we end up tossing all caring factors of humans, and leave the gaping wide opening for the AIs to take us over. So, how can we less-stressing those factors? Finding out the solutions would be even more difficult than teaching AIs how to get angry. Are we fully in control of our technology? "The world’s spookiest philosopher is Nick Bostrom, a thin, soft-spoken Swede. Of all the people worried about runaway artificial intelligence, and Killer Robots, and the possibility of a technological doomsday, Bostrom conjures the most extreme scenarios. In his mind, human extinction could be just the beginning. Bostrom’s favorite apocalyptic hypothetical involves a machine that has been programmed to make paper clips (although any mundane product will do). This machine keeps getting smarter and more powerful, but never develops human values. It achieves “superintelligence.” It begins to convert all kinds of ordinary materials into paper clips. Eventually it decides to turn everything on Earth — including the human race (!!!) — into paper clips. “You could have a superintelligence whose only goal is to make as many paper clips as possible, and you get this bubble of paper clips spreading through the universe,” Bostrom calmly told an audience in Santa Fe, N.M., earlier this year. Bostrom’s underlying concerns about machine intelligence, unintended consequences and potentially malevolent computers have gone mainstream. You can’t attend a technology conference these days without someone bringing up the A.I. anxiety. It hovers over the tech conversation with the high-pitched whine of a 1950s-era Hollywood flying saucer. People will tell you that even Stephen Hawking is worried about it. And Bill Gates. And that Elon Musk gave $10 million for research on how to keep machine intelligence under control. All that is true. How this came about is as much a story about media relations as it is about technological change. The machines are not on the verge of taking over. This is a topic rife with speculation and perhaps a whiff of hysteria. But the discussion reflects a broader truth: We live in an age in which machine intelligence has become a part of daily life. Computers fly planes and soon will drive cars. 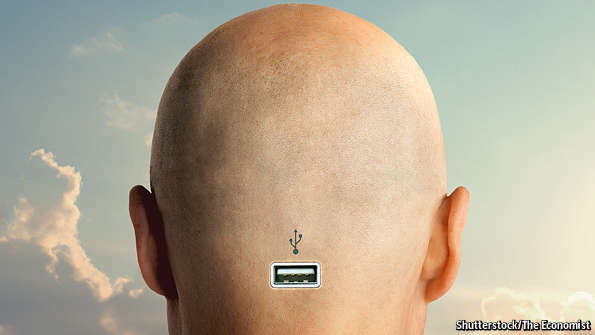 Computer algorithms anticipate our needs and decide which advertisements to show us. Machines create news stories without human intervention. Machines can recognize your face in a crowd. New technologies — including genetic engineering and nanotechnology — are cascading upon one another and converging. We don’t know how this will play out. But some of the most serious thinkers on Earth worry about potential hazards — and wonder whether we remain fully in control of our inventions. "In the fight against 'wicked' problems, computers may be humans' best allies. Researchers from the Human Computation Institute and Cornell University say that the combination would create a superintelligence, and it could take on growing issues like climate change and geopolitical conflict. New technologies use crowd-sourced input and interactive tools to produce collaborative results that go beyond traditional problem-solving, they claim. Wicked problems are those which are difficult to solve because of the complexity of the underlying issues. They involve many interacting systems which are always changing, and the solutions have unforeseen consequences, according to the Human Computation Institute. By joining with computer intelligence, humans could expand upon their own abilities to create 'multidimensional collaborative networks,' the researchers say. This could more effectively produce solutions. In human computation systems, data are processed by a computer and also analysed by humans. Current systems of this type rely on individually completed 'micro-tasks,' which are later stitched together for a final result. New technologies aim to approach wicked problems where micro-tasking alone fails, breaching the traditional limits. "Scientists are closer to creating a computer with emotions. Researchers in Russia are expected to reveal an emotional computer within a year and a half, which will be able to think like a person and build up trust, its creators say. The system, called 'Virtual Actor', is being created by the National Research Nuclear University in Moscow. Computers are machines used for practical reasons, without any emotion involved. But this could be set to change as a new machine, expected to be revealed within a year and a half, will be able to think like a person and build up trust, its creators say. Its name was given because one of the main functions it will serve will be as an actor, playing the role of a specific person. 'The researchers say it will understand the context of what is going on, as well as keeping up with unfolding events. The machine needs the ability to study not through programming or reinforcement learning, but as a thinking person, the researchers said. The machine itself must be able to set learning goals, formulate questions to achieve these goals and actively seek the answers. The researchers started by looking at how the human brain works. 'Our principal goal is to formulate the basic principles that natural intelligence in the human brain is built upon,' Professor Alexei Samsonovich from the Cybernetics Department. 'Biological solutions are in many respects superior to artificial solutions in terms of their adaptability, learning ability, resistance to unexpected interventions, and so on, and we would like to model these principles on the computer.'" 'I very much hope that artificial intelligence will be free of human flaws. Now, amid the development of biological and genetic weapons, artificial intelligence is the most harmless of upcoming discoveries. I believe it will be a major step forward, a big event for humankind,' Professor Samsonovich said." <<<and therein lies the rub, IF humans are creating it, then how could it be free of human flaws, and would it not learn them from it's human companion? AIs don't have the calculation power of getting the 6th sense like humans do yet. But before the AIs choose that path, we ought to teach them that we got some almighty quality that they never reach by themselves so they must learn to appreciate and protect humanity instead of making us do what they want to do. The AIs never can pour LOVE to us. And we start to create consciousness that relays our beings to that inanimate object. A notorious runaway robot - that has escaped from its lab twice - has been arrested by police at a political rally. Promobot was supporting Russian Parliament candidate Valery Kalachev in Moscow when authorities attempted to handcuff it and take it away. It is believed that the arrest occurred after a member of public called police as Promobots were recording the opinions of voters on a variety of topics "for further processing and analysis by the candidate's team." 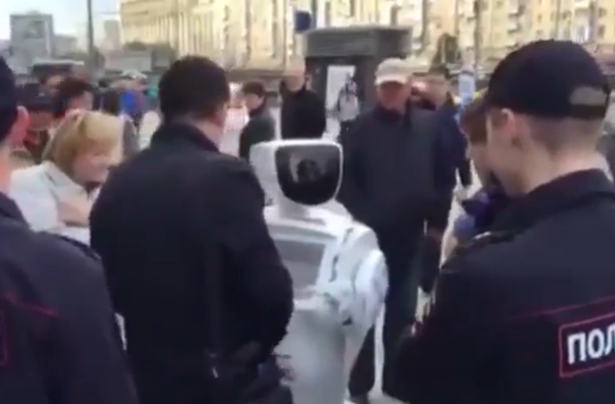 A company spokesman told Inverse magazine: "Police asked to remove the robot away from the crowded area, and even tried to handcuff him. Awww(≧▽≦) Loved the news, breezy! I couldn't agree more unity, methinks this is a very slippery and dangerous slope we're headed down. "The Massachusetts Institute of Technology have created a ‘Nightmare Machine’ that uses state-of-the-art deep learning algorithms designed to transform images of “haunted” faces and places into terrifying pictures. 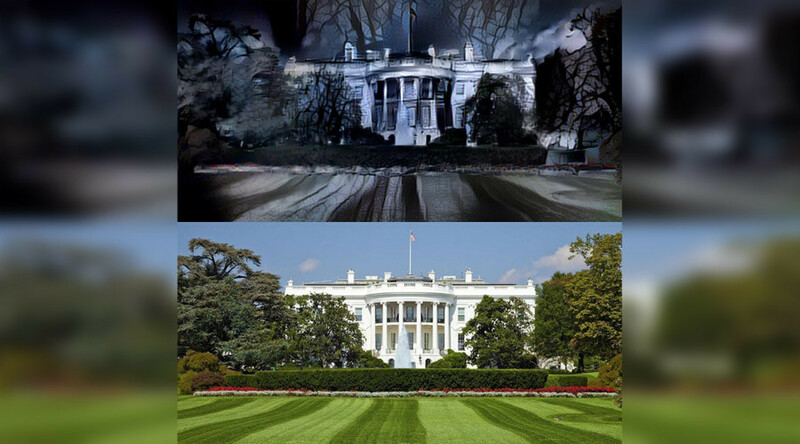 The website features various “horror” images of iconic landscapes, buildings, places and faces generated by artificial intelligence. Tx w now I ask you this, can you see this technology being used for........other things? There's a video in the article. Professor Hiroshi Ishiguro has spent decades trying to create lifelike androids. 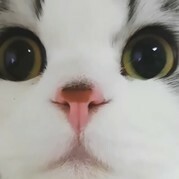 Meet Erica. With the world hurtling closer to AI/human hybrids, it’s never been more important to get an education in advanced artificial intelligence. Unfortunately, the new training platform created by OpenAI, a San Francisco-based nonprofit, is only available to AI — so if you’re human, you’re out of luck. The new ‘college’ is, in actuality, a training platform called Universe, whereby AI can interact with games, web browsers, protein folding software, and “transfer learning,” which allows them to take what they’ve learned in one application and apply it to another. The AI engages via Virtual Network Computing, or VNC, which involves them sending simulated mouse and keyboard strokes. The process proceeds through trial and error and risk and reward. The Universe digital suite’s home is in the OpenAI artificial intelligence learning center in San Francisco, where developers will begin “measuring and training AI agents.” OpenAI is the non-profit brainchild of entrepreneurs Elon Musk and Peter Thiel, who have made no secret of their ambitions to greatly accelerate the research and development of transhumanist technologies. Of course, OpenAI has competition. DeepMind, Alphabet’s artificial intelligence division, recently announced it will open-source its 3D playground of AI research, as well. This is yet another environment in which AI agents will be autonomously operating and striving towards educational benchmarks. With Musk’s OpenAI, the open platform nature is of primary importance because Musk believes it is important for AI to develop in a decentralized environment in which there is no monopolistic power in charge. The idea of AI/human hybrids figures into the model, as well. Musk believes it’s critical that AI trains on interfaces created for human use. This way, the AI becomes more human-like during its cognitive evolution. With more and more transhumanist researchers convinced that humans and artificial intelligence are destined to merge into symbiotic entities, it seems fitting that the new training programs seek human behaviors in their modeling while also providing open environments for deep learning to take place. This article (Humans Can’t Attend Elon Musk’s New ‘College’ – It’s for Artificial Intelligence Only) is free and open source. You have permission to republish this article under a Creative Commons license with attribution to Jake Anderson and theAntiMedia.org. An Earthling = "inhabitant of the earth"
A Human = "of or belonging to man"
"Enjoy beating robots while you still can. 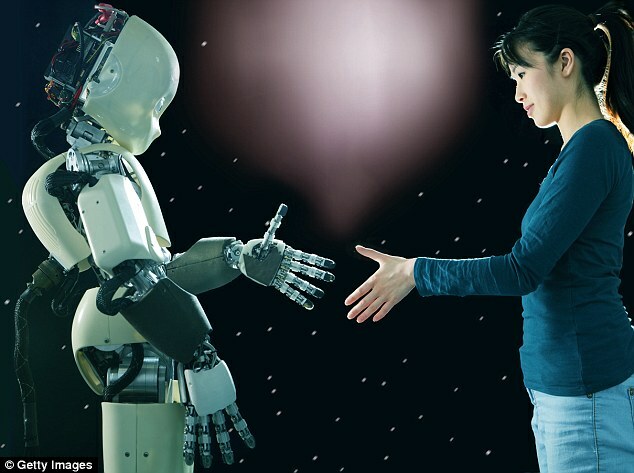 There is a 50 per cent chance that machines will outperform humans in all tasks within 45 years, according to a survey of more than 350 artificial intelligence researchers. AI will master many activities a lot sooner, though. Machines are predicted to be better than us at translating languages by 2024, writing high-school essays by 2026, driving a truck by 2027, working in retail by 2031, writing a bestselling book by 2049 and surgery by 2053. In fact, all human jobs will be automated within the next 120 years, say respondents. The survey, by the University of Oxford and Yale University, was sent to AI researchers who published in 2015 at one of two big conferences in the field – the Conference on Neural Information Processing Systems and the International Conference on Machine Learning. In total, 352 people responded. The results have “far-reaching social consequences,” says Katja Grace at the Machine Intelligence Research Institute in Berkeley, California. How will teachers deal with computer-generated essays that are indistinguishable from the real thing, for example? But at least we will still be around to deal with these issues. Despite media hype about the dangers of AI, the researchers put only a 5 per cent chance on computers bringing about outcomes near the level of human extinction. AIs can already outperform humans in many tasks. AlphaGo, Google DeepMind’s AI, has just beaten the best human Go player in the world. Other systems can lip-read better than professionals or help detectives sift through police data. Yet each of these is only good at one task and would be useless at most others unless retrained. “There is accumulating evidence that machines can overpower human intelligence in complex, though specific tasks,” says Eleni Vasilaki at the University of Sheffield in the UK. But there is little evidence that AI with human-like versatility will appear any time soon, she says." In the future, SONM computing resources will be used for the management of developing computer-neuronal interfaces by uniting them into one network. "By 2050, humans will ditch speech and communicate using nothing but their thoughts. They'll do this through a 'collective AI consciousness' that is part of the very fabric of the human brain and can reveal what anyone is thinking. Called HIBA, which stands for Hybrid Intelligence Biometric Avatar, the consciousness will take on the personas of its users and exchange information between them. That's according to Marko Krajnovic, the producer of the exhibit in Dubai that is this week showcasing predictions by AI experts. The collective consciousness was unveiled at the Museum of the Future this week, as part of the World Government Summit in Dubai. 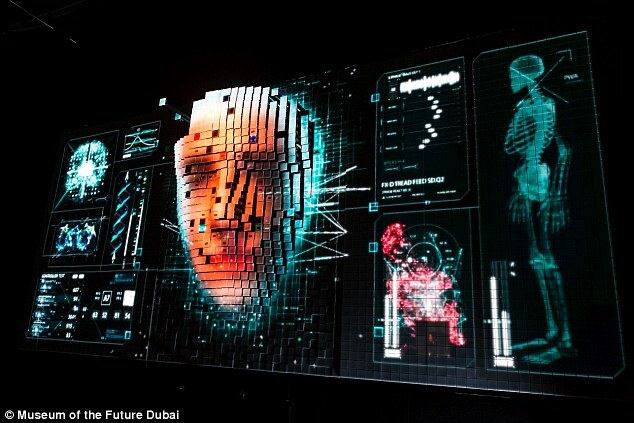 The UAE government and the Dubai Future Foundation worked together to produce the exhibit to show how they envision the future of AI to look. 'HIBA is the result of months of original research by the Dubai Future Foundation on the future of AI. 'It comes from dozens of expert interviews and original in-depth research,' said Noah Raford, chief operating officer of the Dubai Future Foundation." We’re half way there already. Texting, Twitter, social media in general are destroying people’s communication skills. Person to person communication in real life is rapidly degrading. People are forgetting how to talk to each other from lack of necessity. Social media encourages users to pour every thought they have that runs through their head into the digital universe. It’s worse with the younger generation that has grown up with auto-correct and cell phones from an early age but I notice it with everyone. Verbal communication is significantly more ‘clunky’ than it used to be. People don’t use words correctly, they’re lacking social graces, they say too much and can’t self edit. 20 more years of this and we’ll all be bumbling, incoherent morons. Bryan, you do have a way with words and I couldn't agree more. To me it is downright scary. This is AI is being encouraged by Alien AI - in an attempt to control and keep hu-mans in sub-servience. When hu-mans remember that they have the power of Telepathy (communicating by thoughts), something we all have, but few acknowledge or use, then we will find we are free of the Matrix - it will just cease to exist, and new much higher, lighter realms will suddenly be present.. I do agree telepathy is a forgotten but natural ability. Seth said that it operates constantly and without our conscious awareness of it. Then perhaps where we are is a necessary step in the evolution of communication. These are the training wheels for direct mind to mind connection. But we’d better learn how to origanize, select, and filter our thoughts though. Because if what I’m seeing on social media is a sign of things to come - when people just text-barf every stupid thought that comes through their head to anyone who will listen - no other race will want to communicate with us. And we probably won’t want to communicate with each other either. I know if people could read my thoughts I would probably be ostracized and ridiculed. I would also get slapped a lot.